In this fifth episode of a special podcast series teaching the fundamentals of fundraising, you’ll learn how to build and maintain donor relationships. Building and maintaining donor relationships is the lifeblood of any nonprofit organization. This is a crucial point to understand and to communicate into your organization. You will learn why building relationships with donors is important, how your current definition of donor relationship may be wrong, and how different donor audiences need different types of relationship building techniques. My teenage daughter is interested in nonprofit fundraising, so I’ve created a special series in Nonprofit Answers to help her learn fundraising. I know the information in these episodes can help everyone in nonprofit development. Building and maintaining donor relationships is the lifeblood at any nonprofit organization. This is a crucial point to understand and to communicate into your organization. 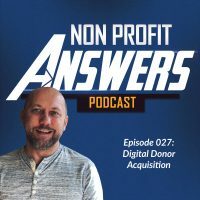 In today’s episode of Nonprofit Answers we’re going to talk about building donor relationships. Today’s episode is one in a series of episodes that I’m recording for my 15-year-old daughter, Emily. A short time ago Emily showed interest in what I do for a living and I’m creating this series to teach her fundraising. In each episode we explore a core fundraising topic, my goal is for her to understand fundraising, and it’s the same goal I have for every member of my audience. I want to explore topics that can help you become a better fundraiser. I know that you’re going to love today’s episode as we’re exploring donor relationships, you will learn why building relationships with donors are important, you’ll learn how your current definition of donor relationships may be wrong and how different donor audiences need different types of relationship building techniques. We are not going to talk in depth today about major donor, those who give high amounts of money, as relationship building with them is vastly different than with your general donor file. We will address it a little bit later in the episode but we will address major donors in much more depth in a later episode entirely. So let’s talk about what we mean when we say you need to build relationships with your donors. I have a friend who’s a development director at a biblical education nonprofit, this organization has been around for some time and it’s focused on the teachings of a specific person, a sort of giant in the faith, someone who’s written a lot of books, preached a lot of messages, recorded a lot of radio programs and television shows, he’s a charismatic teacher who brings a lot to a lot of people. The development director and I, we were debating the nature of the relationship that the organization has with its donors, I won’t quote the conversation verbatim, mainly because I don’t remember exactly how it went, but I remember a lot of the details about it so I’m going to instead give a little attitude but get the concepts right. “Jeremy,” he began, “you just don’t understand, our people love pastor, his content is all we need to build a relationship,” now I’m going to call the development director Todd just for the sake of the conversation, “Todd, I think you’re confusing what a relationship is. You see a relationship isn’t your organization pushing content out, no matter how good that content is. It’s a two-way street, you need conversation, you need to ask questions and receive honest answers, you need to talk with not to donors. Your content is great and it does speak to their hearts, but it’s not a relationship.” Todd replied, “But there is a relationship, the pastor has the relationship with these people.” I started asking serious questions like, what kind of return on investment are you getting in your fundraising programs? What is the attrition rate of your donor file, meaning how many people stopped giving? Are you getting lapsed donors to give again? As we explored each of these metrics Todd began to see that even though the content that the organization produces is great, they’re not really in a relationship with their donors. Instead, people are consuming the content, but by and large they’re not giving. Todd had confused activity with relationship. He believed because people acknowledged how good the teachings are and that viewership was steady that the donor was in a relationship. But in reality, the donor likely felt that the organization was speaking at them, not with them. A relationship with a two-way street is communications not just from your organization to a donor, but it’s engagement with the donor. If you don’t build a relationship with your donor, you’re going to experience attrition as donors quit giving and becomes lapsed donors, you’ll experience decrease in conversion rates on your appeals, you’ll see people giving less when they do give. So when they used to give an average of a $75 donation, you might be seeing that average creep down to $65, to $60, to $50. When you focus on building strong relationships with your donors, you’ll find that your donor file becomes healthier that you’ll convert more leads into donors. The donors give more because they have a passion for what you do. You’ll create more advocates and volunteers, and you’ll be able to do more of the good work that you do. Creating a culture within your communications team to build relationships results in greater lead to donor conversion. Many nonprofits create opportunities for people to signup for their email list, often this is their giveaways, which is ebooks, special reports or maybe in physical premiums, it can also be through webinars, online courses, teleconference calls with leadership and other things like that. We use a series of ebooks, we’ve used audio files, we’ve even used lead-gen at events like concerts to get people to sign up. All of these tools help build your email list. The intent, of course, is to convert these people to become donors. When you develop communication patterns to encourage people to get to know your organization and for you to get to know them, don’t forget that part, then you’re going to experience deeper relationships with people who are not yet donors. As the trust build with the potential donors, you’ll increase the likelihood of obtaining that first gift. Relationship building leads to more frequent gifts and gifts of a greater amount. Though this shouldn’t be your only goal, it is a benefit of building deeper and stronger relationships with your donors. Your donor has a passion for the cause that you’re working for, they have a passion for the beneficiaries that you support as they grow to like and know and trust your nonprofit more, the donor will increase giving to your organization. The point of developing relationship with the donor isn’t to gain more donations, you gain more donations as a byproduct of developing deeper relationships. People like to be around people that respect and honor them, when you build deeper relationships with people you’ll find that your number of volunteers and advocates will increase and people will serve as volunteers and advocates, they’ll commit more time and energy to your organization. Building strong relationships with your supporters allows you to do more of the good work that you do. How do you build relationships with different audiences? As I mentioned earlier, building a relationship isn’t a one-way street, it’s not communicating at your audience, but instead engaging with your audience. This is a common statement, but how do you translate that into action? How do you actually build relationships, especially with your mass donor audience? Today I’m going to explore building relationships for major audiences. Within each audience, let’s talk through some of the tactics that you can use to build a relationship with these types of donors. The four audiences are general, or mass donors, continuity, sometimes called monthly donors, mid-level donors, and major donors. General donors, some people call these mass donors, these are people who make one-time gifts to your organization. These donors may make multiple donations and hopefully they do, and are likely yo respond to your fundraising campaigns. Our goal with general donors is to develop tactics that allow you to build relationships at scale. You may not have very many donors, but even a thousand general donors is a lot to deal with at a time. So, how do we build these tactics that can encourage relationship building with a large number of people? The first thing to remember is that donors support your organization for different reasons. As you learned a few episodes ago there are many different motivations for giving and different psychological triggers that will move people to donate. Since there are different reasons why people give and donors have different interests, you have a number of different ways to engage with donors in unique ways that are meaningful to the individual donor. Second, you need to listen to your donors. Use surveys, phonecalls, listen on social media, hear what your donors desire. Listening is more difficult than it sounds. We sometimes assume that we know what our donors want and don’t really listen to what they’re telling us. I’ll give you an example, we heard from many donors that they wanted to invested in a program that was entrepreneurial in nature, we build what we thought they wanted, a program to invest in community startups that we called ground-breakers. We were very excited for this and thought it meant what our donors were telling us, but we didn’t seek any donor feedback during the campaign development. It didn’t work. We had one major donor fund it, but it otherwise fell flat. We didn’t really listen to what the donors wanted. What we did hear were donors telling us they wanted to fund programs that support refugees and children in difficult situations that child sponsorship couldn’t reach. So we created what we called Children in Crisis, and it created a quarter million dollars of recurrent annual revenue in its first year to help children and families in these difficult situations. When we listened to what our donors asked for, we created a successful fundraising program. You can also engage donors in conversation in social media or through teleconferences, create opportunities for donors to hear from your leadership and allow the donor to ask questions. This type of communication builds significant trust in the organization. An easy way to accomplish this is to host a Facebook live with your CEO, or your president, your executive director, have a host and have that host collect and ask questions from the audience. Live video is a great way to connect people to your leadership team. Send an anniversary card or video message for the anniversary of a donor’s first gift. A handwritten thank you card tells the donor that you care about her and that you recognize her contribution to your organization and the cause. Some organizations are looking into a personalized, custom video solution, there’s a lot of platforms out there that do that. This is a tool that allows someone on your staff to record a custom video message for a donor and send it via email to the donor, and then the email has a link back to a landing page where the donor can go watch that video message. If you visit nonprofitdonor.com, which is my blog, I’ve got a couple of resources on there that can help you. If you go there and search for thank you or thank your donors, you’re going to find some techniques to thank donors, but you’re also going to find a sample script for a thank you video that you could use for this. Reach out and ask your donors to communicate back with you. Our friends at Tier Fund UK are celebrating their 50th year, and they’re calling this their year of jubilee. This year they took a period of time and asked their donors to not donate and to instead to join Tied Fund in prayer. What courage, Tier Fund is giving up revenue to join with their donors in prayer for their mission. A second group of donors that we want to build a relationships with are those that we classify as continuity, sometimes called these monthly donors. Continuity donors give on a regular pace and they’re typically giving the auto-draft or automatic via their credit cards. Continuity donors can be your very most important donors, they help your organization become more recession proof and they help even out your income throughout the year. There’s a lot of confusion among nonprofit fundraisers about continuity donors, there’s even a book that recommends you never ask continuity donors for a donation outside of their monthly gift because they’re already giving to you monthly. I don’t agree with this advice, and it’s for a simple reason, it assumes that you’re bothering a donor for a donation. It assumes that the donor had negative feelings towards giving, it assume a donor doesn’t want to support your organization beyond that monthly gift. What I found at Food for the Hungry, and we have a continuity program that has quite a number of people under 50,000+ donors and that tens of thousands of these donors give beyond their monthly gift. There’s a simple reason for this, these donors are limiting their desire to do good, so when the donor sees an opportunity to help she gives more. On the other end of the spectrum, I wouldn’t recommend inundating monthly donors with additional appeals. Instead, I recommend a good balance of asking a few times per year with campaigns that match the donor’s interest. The donor sees giving as a positive thing in their life, giving them an opportunity to feel good is a good thing in your relationship. You want to give opportunities for the donor to feel good. You just don’t want to overdo it. One of the earmarks of building good donor relationships is the ability of your organization to create more value for the donor. One way you can create more value for your continuity donors is giving them gifts that are meaningful for your cause. For example, when someone becomes a monthly donor at MAP International, MAP sends them a welcome kit and it has some MAP branded items in it to really engage with them in a way where they can feel connected to the ministry of MAP International. You can use ebook as a gift to give value to the donor, do you have an ebook aligned to your cause? It will provide value to the reader. For example, Best Friends, it’s a nonprofit that rescues neglected pets, they give a bimonthly magazine to donors, creating these assets simply to provide value to your donors, it helps them to like, to know and to trust you more. You also want to create ways for monthly donors to give feedback your organization and a method for you to respond to that feedback. Monthly donors are some of your best donors and you want to listen to what they’re communicating. If you don’t have a mid-level donor program that is distinct from your major donor program, I think you’re making a crucial mistake. Mid-level donors are different than major donors, both in the number on file and also how you should communicate with them. You see, a donor who gives a thousand dollars a year doesn’t expect the same type of personal contact that a donor who gives $25,000 expects. If you offered to come and fly and visit a mid-level donor, you might question your allocation of fundraising expenses. If a major donor is contemplating a hundred thousand dollar gift, a personal visit may be required. Different organizations define mid-level donors differently. For sake of example, one way you might define a mid-level donor is everyone is giving between a $1,000 and $5,000 in the past 18 months with everyone giving above $5,000 falling into your major donor program. The constraint often lies more in the major donor side of things. If you’re trying to keep your major donor rep caseload to about 100 people per rep and you have five reps, then you need to find the threshold accordingly. Most organizations with a mid-level donor program have a number of mid-level reps who call those mid-level donors. The primary relationship with mid-level donors occurs over the phone with a fallback to email. The role of the mid-level rep is to maintain a caseload where he communicates with a specific group of donors overtime and builds a relationship with those donors. The mid-level rep should call to check in on the donor from time to time in a role of relationship building, not asking for money but just to call and check on the donors. And then there’s also opportunity for the mid-level rep to call donors with a specific campaign best fits their desire to help. Major donors will also have a rep assigned, the difference is that in the relationship building process with major donors, and also potential major donors, it’s much more hands on. Often a major donor rep will travel to a geographical area and setup meetings with people in person with the major donors that are in the area. Often major donors are also given custom proposals for their fundraising to really meet the things that they desire to give to. This is an area that has the best opportunity for relationship building for your organization. The major donor rep should work to build a personal relationship with the major donor. This may include personal visits, phonecalls, emails, invitations to special events. At Food for the Hungry one of the ways we connect with major donor’s interest is through political advocacy. We have a team in Washington DC that works with politicians on both sides of the aisle to advocate for the poor and the hungry. Many of our major donor partners enjoy the opportunity to advocate on our behalf with senators and congressmen to invite them to lunches and special events for a small group access to these representatives. The donor feels appreciated and we connect their passion with something that makes a difference. Another way to build relationships with major donors is through events and it’s to ask that donor to host a special event for your organization. You can structure this event in a number of ways. Now, one way we found to work is to have the donor host a dinner for your organization, the donation appeal doesn’t have to be direct at the event. Instead, the ask is for people to meet in the next few days for coffee if they’re interested. Major donors are interested in supporting the cause and so you shouldn’t go over the top on materials or gifts to the donor, the donor will perceive that something overproduced costs too much money and will think that you’re wasting their dollars. The best book on building major donor relationships is Donors are People too, and it’s by Timothy Smith. He’s a mentor of mine and a close friend. I highly recommend this book. Read it if you’re looking for a masters course on relationship building because even though it’s about major donors, it really dives into all of these techniques about how you build relationships with donors and why you should build relationships with donors. Grab the book, Donors are People too. It’s on Amazon, Barnes Noble, I’ve seen it in a number of places. Building donor relationships, it’s fundamentally the primary task of a nonprofit fundraiser. When you succeed at that, all of the other pieces fall in place. Thanks for joining me today for this special episode of Nonprofit Answers as we explore fundraising concepts and learn to be the most effective fundraisers that we can be.